Saturday, Aug. 13, 2016: That's the date Michael Phelps participated in his last Olympian swimming event. Between an Olympic career that lasted 17 years, a persona that's arguably bigger than the sport of swimming itself, and an insane 23 gold medals, Phelps has become known as one of — if not the — greatest American athlete of all time. It's no surprise then, that Michael Phelps' Olympic history is full of unforgettable moments. Phelps isn’t merely the greatest butterfly swimmer, though that's what he's known for; he's also the best medley swimmer (combining butterfly, backstroke, breaststroke, and freestyle into one race). He's broken an insane amount of records, and proven time and time again that when it comes to what he can do in that pool, there are no limits. He's a swimming machine, with the type of legacy that people will still be discussing decades from now. As long as Olympic swimming exists, Michael Phelps' legend will too. As the 2016 Rio Games allegedly mark Phelps' retirement, he fired on all cylinders these past couple of weeks, bringing everything he had for his final Olympic strokes. But, let's not forget where he started and how much he's achieved. Below, 17 of Michael Phelps' best Olympic swimming momentsover the course of his career at the Games. During the 2000 Summer Olympics in Sydney, Australia, Phelps only participated in the 200-meter butterfly. Though he didn't take home a medal, getting fifth at the age of 15 was an impressive way to begin his Olympic career. During the 2004 Summer Olympics, Ian Crocker held the record for the 100-meter butterfly. Everyone thought Crocker would take home the gold — but Phelps came in and beat him by 0.04 seconds. Phelps won his first individual Olympic gold medal in the 2004 Games. He beat his competition in the 400 individual medley by a whole 3.55 seconds, a world record-breaking performance. His time of 4:03.84 — which he accomplished at the 2008 Games — remains number one. Setting an Olympic record with a time of 50.58 seconds, Phelps defeated Milorad Čavić of Serbia by one one-hundredth of a second during the 100-meter butterfly at the 2008 Summer Olympics. Phelps won gold in the 200-meter butterfly in Beijing, but more impressively, he did it almost blind. Apparently, during this race, water leaked into Phelps's goggles and he had to guess where the wall was in order to complete his turns. That 200-meter butterfly sent Phelps into the double digits for gold medals. It also broke a world record. Phelps lost the 2004 200-meter freestyle, but in 2008, he blew everyone out of the water. His final time (1:42.96) beat Park Tae-hwan's by almost two seconds, which effectively became the largest margin of victory in the 200-meter at the Olympics. Phelps took home eight golds in the 2008 Beijing games. Phelps took home his first London Games gold in the 4x200-meter freestyle. It was this medal that made him the most decorated Olympian in history — with 19 medals. 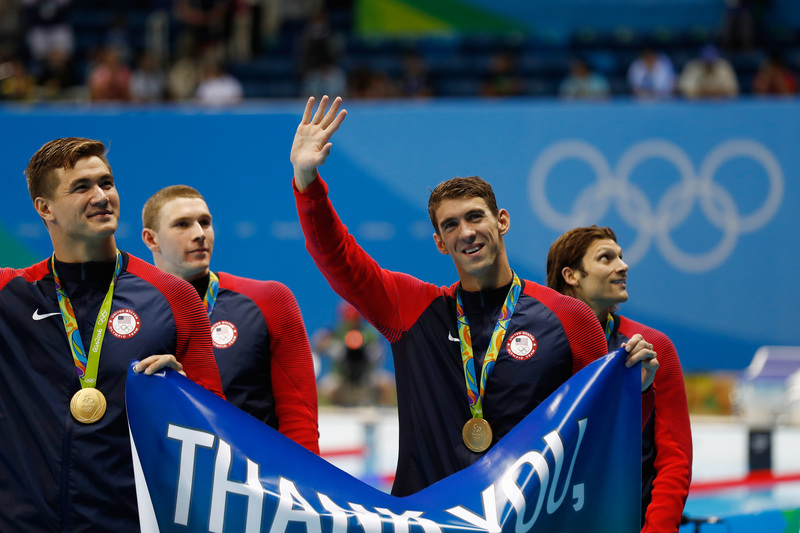 At the 2012 games, Phelps scored his 16th gold medal in the 200-meter individual medley. The win earned Phelps the title of being the first male swimmer to win the same event in three consecutive Olympic games. Then, for the 100-meter butterfly race, after beating Le Clos and Yevgeny Korotyshkin, he did it again. That is, won a gold in the same event for three consecutive Olympic games. Phelps crushed long-time competitor Le Clos and took home the gold. Michael Phelps celebrated after winning his 20th gold medal in the men's 200-meter butterfly final during the swimming competitions at the Games in Rio. The race marked his second gold medal in one night and the 21st gold medal of his career. And of course, not only did he win another medal, he broke another record. For the first time ever, three competitors tied for second place. Watching Phelps over the course of his Olympic careers has truly been something special. He'll definitely be missed at the 2020 Summer Games.